Begin with a plan that keeps the end in mind! You know you want to have a portrait made to celebrate the birth of your baby, but what are you going to do with it? Before I pick up my camera to capture those tiny little features, we need to discuss what is most important to you. How do you want to remember your new baby? Do you have a spot above the crib all picked out? Are you a mom with two older children, and you need to add to a family gallery wall you’ve already started in the play room? Or do you need some inspiration? I am here to guide you! Your personal planning consultation will help me fill your unique needs and create a tailor made plan just for you. Meeting in person to start your portrait session plan is the first step. Getting to know your family and also answering all of your burning questions — probably a few you didn’t even know to ask! What should I wear? Should we bring extra clothes? What will it cost? How should we prepare? We will also schedule a portrait date based on baby’s due date; this usually gets changed a bit but assures you space on my calendar. Getting all the details, and finding out what is most important for you and your family, ensures we have an amazing portrait session. Planning out your wall designs, your clothing choices and your backgrounds ensures everything will look and feel amazing in your home. 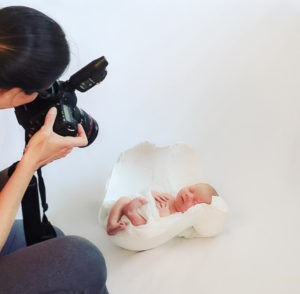 Now that we have made a plan together it is time to create your beautiful baby’s portraits! I work hard to capture your new baby’s tiny toes, lovely lashes and that button nose, everything that makes your baby the one of a kind miracle she is. Capturing all the details that will become cherished memories for a lifetime. After the session you will come in to view a slideshow of your portraits. 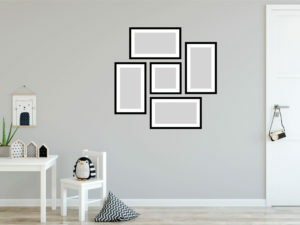 Mockups will be created with your portraits displayed on your walls. If you’ve expressed interest in albums, album mock-ups will be ready too. Every viewing and ordering appointment is customized to create artwork your family will love for a lifetime. Installation of your wall art is included! This is all part of my personal service to you! 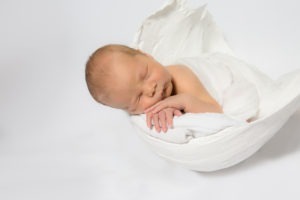 I can’t wait to meet you and start a plan for your newborn portrait session. Still reading this it’s time to get in touch. Contact me here.